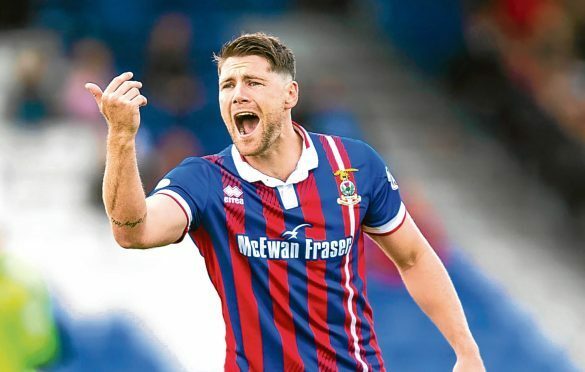 Caley Thistle midfielder Iain Vigurs is adamant that tonight’s hosts Dunfermline will see a much different Inverness side to the one that lost 5-1 at East End Park in August. The Highlanders endured a miserable trip to Fife and their second Championship match of the season provided a stern reminder that adjusting to life back in Scotland’s second tier would not be easy. An incredible run of 10 clean sheets in 11 matches got Caley Jags’ season back on track – a run which included a 1-0 win at home to the Pars. And with a play-off position still in sight, Vigurs, 29, is hoping that his club’s hectic schedule will allow Inverness to build up some positive momentum. “Dunfermline gave us a bit of a doing at the start of the season but we’re a different team from then,” he said. “We have a gameplan and we’re looking to carry it out. “It seems like ages ago when we beat them here but that was a measure of our improvement. “They have a few new signings and a different formation, they don’t really play with their wingers any more. Vigurs has his own reasons to be confident about playing at East End Park. He scored his only career hat-trick there in July 2016 and netted his side’s only goal during their defeat there last August. “It seems to be a happy hunting ground for me,” he said. “It was the perfect hat-trick, too – left, right and head. The matches will be coming thick and fast for Caley Thistle now, with a dozen league fixtures and an IRN BRU Cup final to fit into the next six weeks. It’ll be a tough prospect for their paper-thin squad but Vigurs is sure the team can cope, pointing to the higher number of league fixtures played in England each season. He said: “It feels like we’ve hardly had a game in 2018 and now it’s like we need to play the second half of the season in a month.